This is a record of the building of ten 42-ft. fishing boats in the Bahamas. It illustrates the methods, equipment and organization required to construct ten ferro-cement boats on a remotely situated beach, with relatively unskilled labor. Much of this record is devoted to the fitting out of a ferro-cement boat. It is in some detail, and it concerns one particular design of fishing boat. The construction method chosen was the inverted wooden mold. For hulls up to 50 feet in length, and for utilizing unskilled labor, this method has been shown to be most efficient providing that adequate lifting and rolling gear is available. 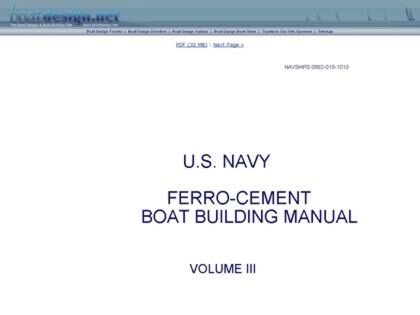 Web Site Snapshot: If available, above is a snapshot of the U.S. Navy Ferro Cement Boat Building Manual - Volume 3 web site at http://www.boatdesign.net/ferro-cement-boat-building-3/001.html as it appeared when this site was added to the directory or last verified. Please Note that Boat Design Net has no involvement with the above web site; all content and images depicted in the above thumbnail are the property and copyright of U.S. Navy Ferro Cement Boat Building Manual - Volume 3 unless otherwise noted on that site. Description: This is a record of the building of ten 42-ft. fishing boats in the Bahamas. It illustrates the methods, equipment and organization required to construct ten ferro-cement boats on a remotely situated beach, with relatively unskilled labor. Much of this record is devoted to the fitting out of a ferro-cement boat. It is in some detail, and it concerns one particular design of fishing boat. The construction method chosen was the inverted wooden mold. For hulls up to 50 feet in length, and for utilizing unskilled labor, this method has been shown to be most efficient providing that adequate lifting and rolling gear is available.